If there’s a must-see wine destination in the Cape Winelands then, according to the Great Wine Capitals Tourism Awards, it’s Vergelegen. The historic 316-year-old estate has just been awarded the 2017 International Best of Wine Tourism, Cape Winelands for an unprecedented fifth time. Since the awards started in 1999, there have been 3 845 entries and 574 winners. No other property has won the international award as often as Vergelegen. This year the awards programme, held annually by the Great Wine Capitals Global Network, attracted 359 entries and there were 59 winners. The entries are from eight of the world’s great wine capitals. These are Bilbao-Rioja in Spain, Bordeaux in France, Mainz/Rheinhessen in Germany, Mondoza in Argentina, Porto in Portugal, San Francisco/ Napa Valley in the United States, Valparaì/ Casablanca Valley in Chile and the Cape Winelands. “Of course we’re tremendously pleased to be rated alongside some of the best estates in the world again. For us the real importance of the Great Wine Capitals awards programme is that it encourages and recognises wineries which invest in their historic, cultural and natural heritage and share these with visitors,’ says Don Tooth, CEO of Vergelegen. Vergelegen is a founding member of the Cape Vintner Classification, an independent body committed to the accreditation, governance and representation of regional, site-specific Cape wines. In the past 14 years the Helderberg estate has earned over 200 accolades for its wines, restaurants as well as its environmental initiatives and investing in and maintaining its extensive 18th century gardens and historic buildings. Its wines continue to garner local and international accolades with respected UK Master of Wine, Tim Atkin, scoring 15 of them at 90 or above in his 2016 South Africa Report, up from the 13 Vergelegen wines to achieve this in 2015. Of the 2016 wines, the 2012 V top scored with 95 points. 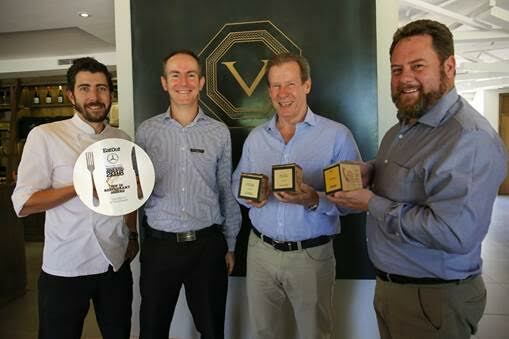 The estate’s Camphors restaurant is also earning its share of recognition, recently again being named as one of the top ten in the Eat Out Mercedes-Benz Restaurant Awards. 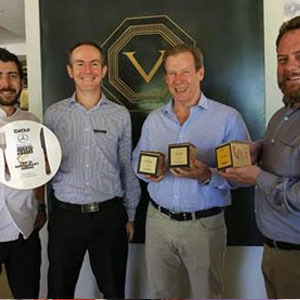 Michael Cooke, Camphors executive chef, Christo Deyzel, Camphors sommelier, Don Tooth, Vergelegen CEO and Andre Morgenthal, South African representative for Great Wine Captials, celebrate some of the historic estates’ recent accolades. Founder Willem Adriaan van der Stel planted the first vines at Vergelegen in 1700. These included varieties such as Chenin Blanc, white muscadel and frontignan. Vineyards also flourished during the Theunissen family’s tenure between 1798 and 1899. In the 20th century there were sporadic plantings by various owners, but these were uprooted in 1962. There were no vines on the estate until 1987 when Anglo American bought Vergelegen. Since the production of the first wine under the new owners in 1992 the estate and its wines have earned more than 200 awards, including twice winning the coveted Chateau Pichon Longueville Trophy for the Best Bordeaux blend at the International Wine & Spirts Competition. Two wines (2000 and 2003 GVB Estate Red) are still receiving accolades a decade after production. All the retail wines are produced from grapes grown on the estate, apart from small, experimental lots that are bottled separately and enjoyed at one-off wine tastings and restaurant events.